Neomycin is a broad-spectrum bactericidal aminoglycosidic antibiotic with particular activity against certain members of the Enterobacteriaceae e.g. Escherichia coli. Its mode of action is at the ribosomal level. When administered orally, only a fraction (<5%) is absorbed systemically, the remainder remains as the active compound in the gastro-intestinal tract of the animal. Neomycin is not inactivated by enzymes or food. These pharmacological properties lead to neomycin being an efficacious antibiotic in the prevention and treatment of enteric infections caused by bacteria sensitive to neomycin. 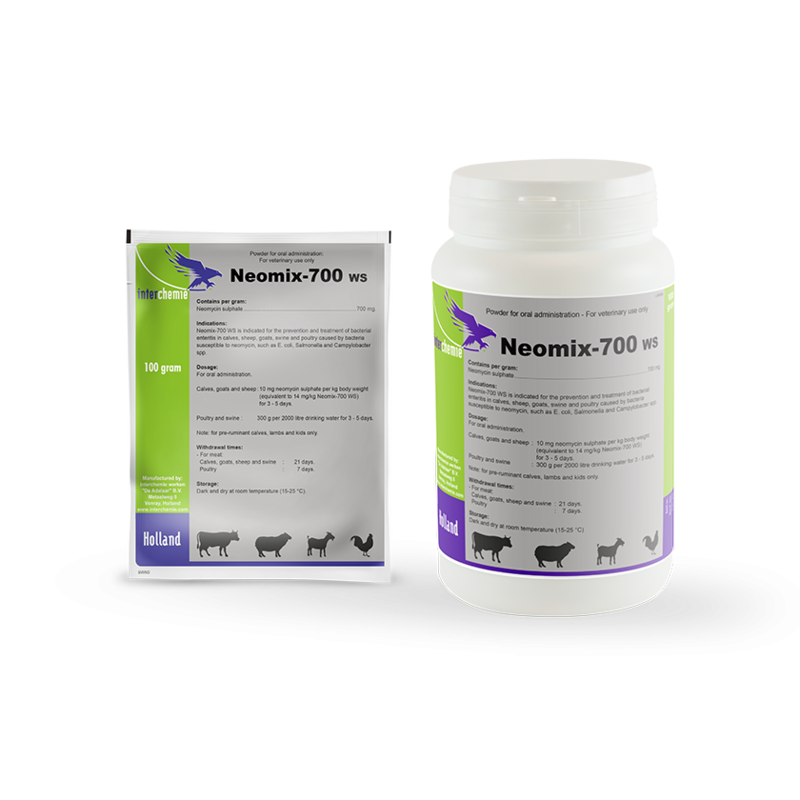 Neomix-700 WS is indicated for the prevention and treatment of bacterial enteritis in calves, sheep, goats, swine and poultry caused by bacteria susceptible to neomycin, such as E. coli, Salmonella and Campylobacter spp. Administration to animals with a seriously impaired renal function. Administration to poultry producing eggs for human consumption. Neomycin’s typical toxic effects (nephrotoxicity, deafness, neuromuscular blockade) are generally not produced when it is administered orally. No additional side effects are to be expected when the prescribed dosage regimen is followed correctly. 10 mg neomycin sulphate per kg body weight (equivalent to 14 mg/kg Neomix-700 WS) for 3 - 5 days. 300 g per 2000 litres of drinking water for 3 - 5 days.